You Are Not a Cat! You Are a Book Trailer! I love making book trailers. I say that knowing that some people simply hate them—and truth be told—there are some really bad ones out there. But in the bookmaking process, they’ve become a great way for me to exercise different problem-solving and story-telling muscles, and serve my upcoming books. Anyone who has written or illustrated a book recognizes the time it takes between pen-first-to-paper to bound book seems endless. Working on something so intensely over a long period of time is exhilarating, but also exhausting. You are worn out toward the end of the process—then you realize that is actually part of the process. You turn in final art, get some proofs, discuss a couple more things with your publisher, and then you wait. And you wait. And you wait some more, until one day, several months before the book releases, you get an advance copy. If you’re like me, at this stage you think, “Hey, I really had fun with this, and I can’t wait to share it with the world.” But then…you remember, you have to wait some more. While I’m in this last part of the waiting phase, is when I’m ready to dive into a book trailer. There are several reasons why I enjoy making trailers. On a personal level, I get to revisit work that I might have been beating myself up about a year ago, and now realize—fingers crossed—is pretty good. I can see that perfectionist in me did her job, and if she didn’t, I learn how to do it better going forward. Because I’m trying to reinterpret the content of the book for a trailer, I start to look at it from a different angle. In short, I’ve got fresh eyes even with something I was involved in so intently, and can now see it clearly since time has provided some distance. I also love sharing stories through my limited capabilities as an animator—emphasis on limited. I made my first trailer using iMovie, only to realize, that it wasn’t good enough for me—so I redid the entire thing in After Effects. By that I mean, I had to teach myself how to use After Effects—within limits, of course. Luckily, there are a bunch of great tutorials and forums online that got me through. Maybe this means I’m a dabbler, but I know I only have so much time to devote to trailer-making. I got my start in children’s publishing a few decades ago as a designer in the Marketing Design Department of a major New York house. It was a terrific gig creating promotional materials, back when there was a little more money to throw around on such things. This was also the era of web 1.0, so needless to say we weren’t doing much with video or animation. But I did observe a lot of smart people, and see how great marketing works. As with social media today, if I can nimbly draw a little more attention to my books through a trailer, that’s a good thing. Back to those limited animation skills—for me, part of the problem-solving in making a trailer is showcasing a book through what I can do, rather than what I can’t. I’m still pushing myself to learn new skills, and I’m surprised at how much new stuff I can incorporate each time I make one. That may be the biggest payoff personally in the long run. I’ve always loved visual problem-solving, and my career as a graphic designer—now as an illustrator—are natural extensions of that. First, I reread the book several times, since it may have been many months since I’ve done so. Then I sit around and think…a lot. Then I take walks and think. I choose touchstones within the book that I want to be sure to hit: what’s clear, eliminate what’s too complicated, etc., In short, find what conveys the story without giving it away. With YOU ARE NOT A CAT, the plot centers on a conversation between the two characters, Duck and Cat who aren’t seeing eye to eye. I sketched out a bunch of thumbnails and wrote down a bit of the text to see how much dialogue should to be included. The more I thought about it and sketched out a few scenarios, the more I realized this trailer could be very concise and still convey the humor of the characters’ relationship. I realized it should be made up of four parts: an introduction of Duck, an introduction of Cat and their conflict, then Duck just not really caring, and zoom—here’s the book. That’s it. 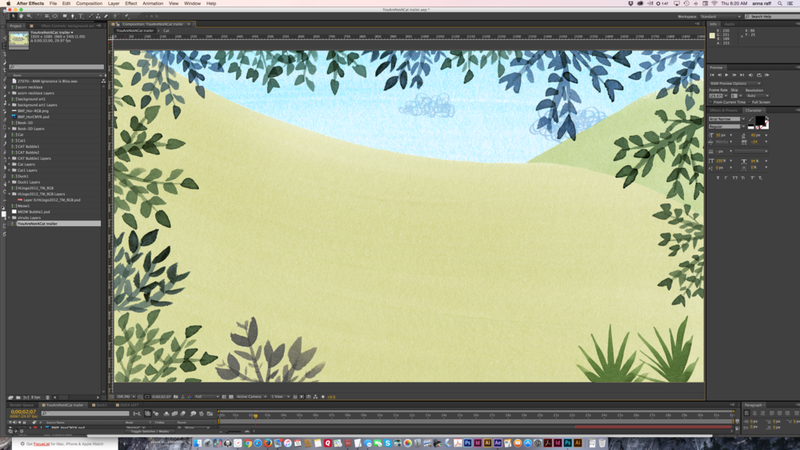 Then I went into Photoshop to adapt my art and create a stage for Duck and Cat. I started by setting up a pastoral background, as is seen throughout the book, and created a simple animation in After Effects of clouds passing by. I did the same for the two characters and their exchange, and added the final sequence with information about the book. Around midway through my brainstorming process, I start to research royalty-free music and, if needed, sound effects. I find music really helps me with pacing and animation details. It also sets a mood as I tie up all the pesky animation details. While I finish, I play the music on loop (as long as I can stand it) to keep me in the same groove. So here’s the finished trailer, and guess what? I really am a dabbler! If you’d like to check out some of my others, here’s a link. Thanks for reading, and if you’d like to get a copy of the book, click here. The Undies Case Cover Awards! About a month ago, I shared the not-so-secret case cover art for YOU ARE NOT A CAT which is due out this fall. The image (seen above) will appear under the jacket (seen below), and in some situations—perish the thought—might go completely unnoticed. One can excuse readers for not looking under jackets because for years…decades really…many of us who love, read, and make picture books were under the assumption that the art of the case of a book always matched that of the jacket. As a picture book designer, I was told it cost more, and there wasn't enough money in the production budget for a separate image. But thankfully, that is no longer *ahem* the case. So, if picture books and sneak peeks at cool stuff are your thing, you might want to check out Carter Higgins' blog Design of the Picture Book where she and Travis Jonker (a.k.a. 100 Scope Notes) have launched “The Undies Case Cover Awards” to celebrate the sometimes overlooked but always meaningful art of the case. There’s a really great gallery of books that have been submitted thus far, and if you’d like to nominate one that you know of, there’s information about that too. Thanks Carter and Travis for drawing attention to our undies!